Since the March 2018 opening of the Anderson Regional Joint Water System (ARJWS) pretreatment facility in South Carolina, complaints of musty-smelling and bad-tasting water have been nonexistent. The complaints have decreased from hundreds each week since 2013, when Lake Hartwell started experiencing harmful algal blooms (HABs) on a routine basis. 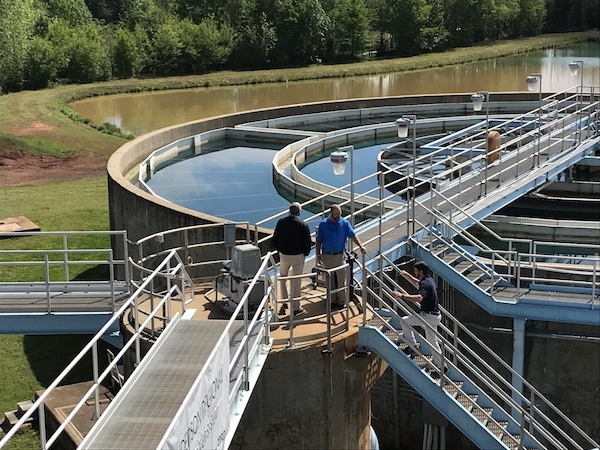 The ARJWS pumps approximately 48 million gal per day (mgd) from Lake Hartwell to 15 municipalities and agencies in upstate South Carolina, serving about 200,000 customers. Heavy rains in 2013 led to elevated runoff of algae-stimulating nutrients into the lake. With the warm summer temperatures, conditions were perfect for an algal bloom. A larger bloom in 2014 and evidence that algal blooms were increasing in duration and frequency throughout the region, made it clear that the problem was unlikely to subside in the foreseeable future. Across the U.S., many types of algae cause HABs in both freshwater and marine systems. In freshwater drinking water sources, HABs typically are an overgrowth of cyanobacteria, also known as blue-green algae. Cyanobacteria are best known for their production of potentially harmful toxins, which can be released in heavy doses as the algae die and their cells break open. The danger the toxins present depend on the type and amount produced. Toxins have been an area of intense focus for state agencies and the U.S. EPA, tasked with overseeing the provision of safe drinking water. Cyanobacteria also produce nontoxic compounds like geosmin and 2-Methylisoborneol (MIB), the source of the dirty tasting water that plagued ARJWS from 2013 to 2017. In 2014, geosmin and MIB levels increased from 50 to 2,000 ppt. These were considered very high levels, as most people can sense the smell or taste at concentrations of 10 to 20 ppt. Conventional treatment systems can be overwhelmed by these algal compounds during an intense bloom. Prevention of algal growth is a global challenge due to climate change and intensive agricultural practices, things that water managers have little control over. Removing the algae upon intake is possible with coagulation or filtration, but the sheer volume of biomass is difficult for plants to manage. Processes that cause the cells to die can worsen the situation because the toxins and odorous compounds are released into the water. Once released into the water, treatment options become fairly narrow. Officials at the ARJWS were familiar with these challenges. They tried various recommended practices, such as copper- and peroxide-based algaecides for in-lake treatment. Adding powder activated carbon and chlorine dioxide within the treatment plant to adsorb and oxidize the objectionable compounds also was met with limited success, due to the high concentrations the HABs generated. While the water remained in compliance with drinking water quality standards, utility managers were intent on solving the taste and odor issues and took action. They hired engineering consultant Goodwyn, Mills and Cawood (GMC) of Greenville, S.C., to implement a treatment system upgrade at the facility using the Construction Management at Risk (CMAR) project delivery method. The CMAR project delivery approach was chosen to meet the schedule and provide the most value through a collaborative relationship among the designer, builder and equipment supplier. The goals established for the new treatment system were two-fold: eliminate seasonal taste and odor events and the color associated with naturally occurring iron and manganese, and establish resilience against algae-linked compounds and other contaminants of emerging concern (CECs). As part of a three-phase approach to select optimal treatment technologies, GMC worked with Xylem Inc., which provided treatability testing and analysis of four treatment options: ozone along with various combinations of three advanced oxidation processes (AOPs)—ozone, hydrogen peroxide and/or ultraviolet (UV) light—to meet the treatment goals. Ozone is generated by means of a silent electrical discharge in an oxygen-containing gas. As soon as ozone is introduced into water, any hazardous pollutants present are effectively degraded through oxidation without creating harmful chlorinated byproducts or significant residues. By decomposing into oxygen as it reacts, ozone provides a cost-effective and environmentally responsible alternative to oxidation with chlorine, absorption such as activated carbon, or separation processes such as reverse osmosis. AOP is the combination of two or more processes to generate hydroxyl (OH-) radicals. Compared to other oxidants, OH- radicals have considerably higher oxidation potential, and once formed in water they immediately attack virtually all existing oxidizable substances. The high degradation performance and the quick reaction kinetics of AOP provide the formula for success when it comes to eliminating numerous persistent contaminants. The processes used in AOP—ozone (O3), hydrogen peroxide (H2O2), UV radiation and chlorine—are powerful treatment technologies by themselves. The key to selecting the best AOP solution is to find the right combination of these processes to most efficiently generate OH- radicals that reduce the seemingly non-degradable contaminants and render them harmless. Many of the treatments to adsorb or destroy toxins and taste and odor compounds also are effective for CECs. HAB impacts can be seasonal in nature, therefore, a complete analysis considers turndown capabilities and the associated savings for an accurate life-cycle cost. The overall analysis should consider future treatment objectives and anticipate future regulations. At ARJWS, four rounds of bench-scale testing at varying oxidant doses and MIB concentrations were performed to provide information on contact time, chemical dose, equipment dimensions, equipment head loss and energy requirements. All technologies proved effective in removing MIB from an influent concentration of 400 nanograms per liter (ng/L) to 4 ng/L, which fell below the threshold detectable to humans. This approach, combined with the capabilities of the AOP treatability testing lab, led to the selection of the ozone and peroxide process for ARJWS. The system is designed to feed ozone alone, augmented with peroxide for generating additional OH- radicals. This process was considered the most viable option to address current and future taste and odor, color, and CEC impacts for the lowest combined capital and operating costs over the expected project life. Over a 20-year period, Ozone AOP was the least costly option at $12.5 million in capital costs and $378,000 for annual operation and maintenance cost. As the project moved into the design phase, GMC selected Xylem to provide the full-scale system. The ARJWS system consists of of two 1,000-lb-per-day generators with a future generator to provide the ability to feed 4 mg/L of ozone. Ozone is introduced as a pretreatment step prior to entering the existing treatment process. The ozone is fed into an ozone contact chamber with a retention time of about 12 minutes. Hydrogen peroxide can be fed prior to ozone addition through two static mixers to generate OH- radicals. Peroxide also can be used at the end of the ozone contractor to remove any ozone residuals within the contractor. The $13.5 million upgrade project was completed ahead of schedule and under budget by general contractor Brasfield & Gorrie. ARJWS officials report they are satisfied with the solution and say the effectiveness of the preoxidation process is bringing operational efficiencies to its media filtration system, while reducing chemical use. At the start of the algae bloom season, the system is measuring MIB of 11.2 and 17.7 ng/L and geosmin of 0.5 to 4 ng/L in the inlet of the system, and non-detect in the outlet. Xylem and utility managers will continue close monitoring of the system as higher inlet levels of MIB and geosmin are expected through the summer months. For many utilities utilizing surface water like ARJWS, the presence of unpleasant taste and odor in drinking water is a serious and frequent concern that requires a sustainable and holistic solution. Yet, every source water and utility is different, meaning the exact capital and operating costs will also be different based on the source water quality and other treatment objectives. The addition of advanced oxidation process to ARJWS’ treatment process means the utility can once again provide high-quality, clean, safe and reliable drinking water to residents in the region and meet existing water treatment standards for years to come.